David Cronenberg’s new film, A Dangerous Method, is about the founders of psychoanalysis. 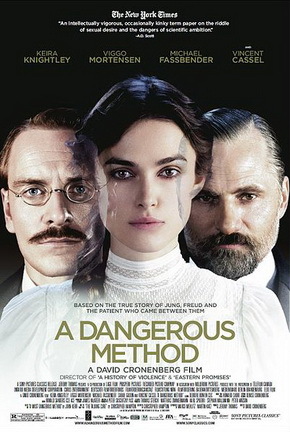 Carl Jung (Michael Fassbender) is asked to treat a young woman suffering from hysteria, Sabina Spielrein (Keira Knightley). Under his treatment, Speilrein starts to improve. She begins studying psychoanalysis. She eventually makes sexual advances on Jung, but he rejects her, partly because he feels it would violate his professional ethics, and partly because of his devotion to his wife, Emma (Sarah Gadon). At about this same time, Jung meets the founder of psychoanalysis, Sigmund Freud (Viggo Mortensen), who makes a strong impression on him. Freud persuades Jung to take as his patient, Otto Gross (Vincent Cassel), who is also a psychoanalyst and who advocates free love. After analyzing Gross, Jung decides to accept Speilrein’s advances. However, when Freud says that he has heard rumors that Jung is having an affair with one of his patients, Jung decides to end his relationship with Speilrein. The latter takes this badly. She eventually announces that she wants to study under Freud. This alarms Jung, who is afraid that Freud will find out about his unethical behavior. The characters all come across as deeply flawed, and the film does not take sides. Overall, however, Jung seems more sympathetic than Freud. The latter comes across as rigid, narrow-minded, and domineering. In one scene he reveals his hand by saying that he wouldn’t discuss one of his dreams with Jung because he didn’t want to compromise his “authority”. There is also a complacency about Freud’s world-view. He tells Speilrein that “the world is what it is”, and that pyschoanalysts shouldn’t try to change it. Yet one cal also see why Freud eventually became disenchanted with Jung; the latter was fascinated with irrational ideas, such as a belief in telepathy. The revelation of his affair with Spielrein becomes the last straw. The acting in A Dangerous Method is very good. I especially liked Mortensen’s performance as Freud. He subtly conveys the character’s arrogance and authoritarianism, without turning him into a caricature. At the end of this film, we are told that Spielrein, who was Jewish, was murdered by the Nazis during World War II. This is a disturbing reminder that our lives are ultimately shaped by political and economic forces that psychoanalysis can do nothing to address. This entry was posted on January 29, 2012 at 8:24 am and is filed under Cinema, Freud, Jung, Psychology. You can follow any responses to this entry through the RSS 2.0 feed. You can leave a response, or trackback from your own site.